Don't get me wrong, I love writing about the latest lipstick (important stuff, right? ), but I also find it necessary to bring attention to beauty issues many of us face, or could face in the future. Let's talk about heredity hair thinning and hair loss. And especially how Women’s ROGAINE® Foam can help. Those statistics grabbed my curiosity, since I'm in my 30s. I wanted to find out as much as I could and see if there were any solutions for hair regrowth. 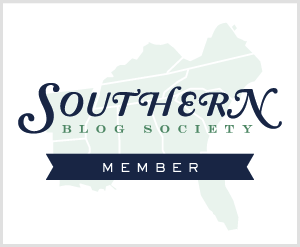 I wanted to provide my readers with the best information as possible, so I turned to an expert. There are many different contributors that can cause hair loss and thinning hair...stress, lifestyle, medications, diet and of course there’s hereditary hair loss, which is passed down from your mother or father’s side of the family. 2-When does hair loss generally start? For women, hair loss can start as early as your 20's, even earlier in some cases and then peak again in your 40’s. 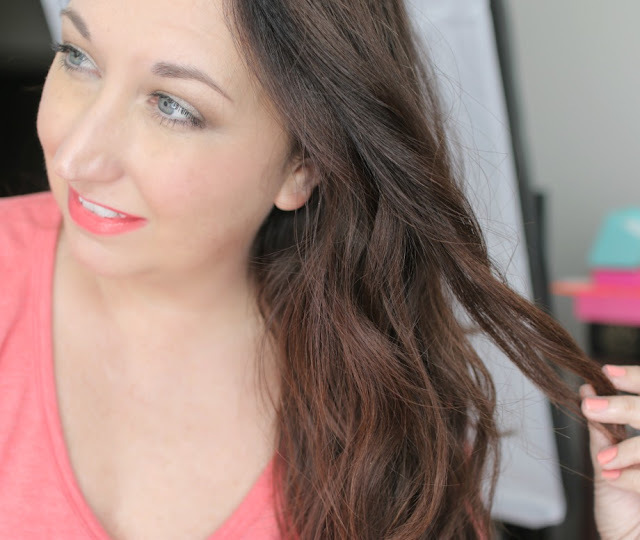 3-What can we do for thinning hair? If you believe you are experiencing thinning or hair loss, the best thing you can do is to begin a treatment program. 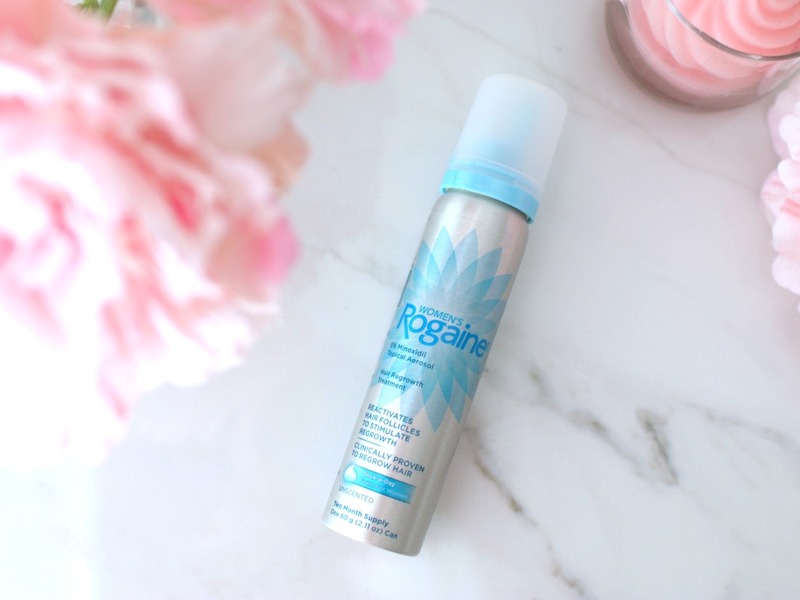 With an efficacy rate of 81%, I always recommend Women’s ROGAINE® Foam—it’s a regrowth treatment clinically proven to regrow 25% more hair with new hairs growing in up to 48% thicker than before. And if left untreated, it can worsen over time. Some surprising info, right? So once I had the info, I was really interested in the Women’s ROGAINE® Foam as a possible solution. 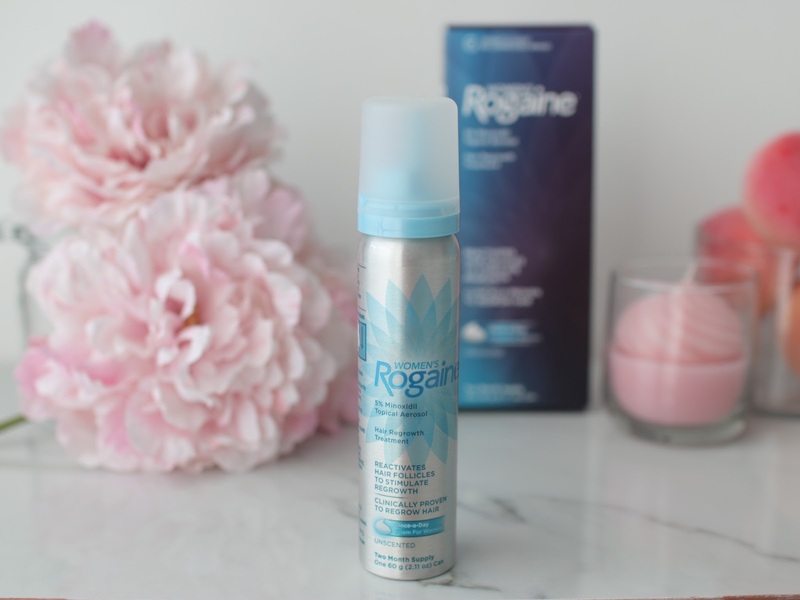 Women’s ROGAINE® 5% Minoxidil Topical Aerosol is the first and only FDA-approved once daily treatment. 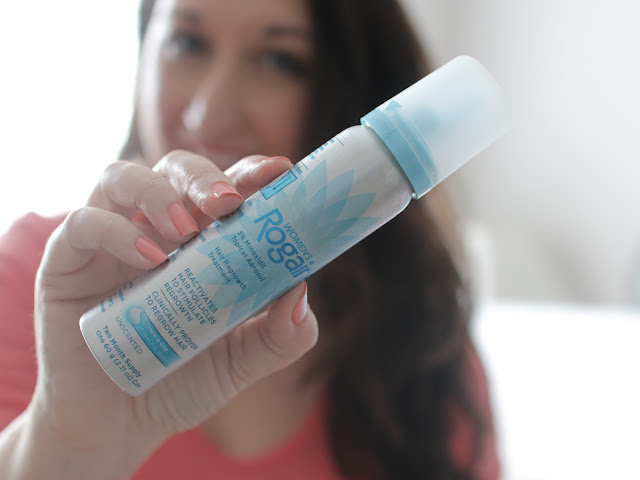 It turns out, Women’s ROGAINE® Foam is super easy to fit into your daily beauty regimen. exposure and massage it into the scalp and allow to dry. You can get more application details here. Your hair won't get greasy or weighed down. It works right alongside your regular beauty products--I really liked knowing that you don't have to change your routine, or change your all of your products, just add an easy and fast step. If you have color treated hair, you can use this! You can use it morning or night. And if used daily, results should start in 12 weeks. I encourage you to find out more and try it for yourself if you're experiencing thinning hair or heredity hair loss. If you are interested in learning more about Women’s ROGAINE® Foam, check out this coupon offer here. Have you heard of this product before? What fact about hair loss/thinning surprised you? Thanks for sharing this! My hair is starting to thin a little so I will definitely keep it in mind. Have a great week Elle! Thankfully I haven't had to deal with thinning hair, but I have a good friend that's already dealing with it. I'll have to tell her about this product! The women on my father's side of the family had thinning hair. I can tell especially after I hit my late thirties and now early forties that I have lost a lot of hair. I may have to give this product a try! Right. Like if taking something for a condition to help treat it, if you stop, the symptoms come back. This isn't advertised as a cure, but a treatment. It's incredible, these numbers and statistics, I had no idea about that! But stress, diet, anxiety, these are things that impact very much, no doubt. My hair is naturallly thin, but I have lots of, so people tend to think it's thick - but in fact, it's very thin. But I have a friend who has thin hair and is experience hair loss since she was 17. Shee is even a bit depressed because of that. Rogaine Foam would be a perfect solution for her! I will recommend it to her! Seriously? Is this over the counter? I feel like in my 40's my hair is thinning out around my hair line & its freaking me out. My hair stylist always tells me how thick my hair is, but I feel like I can see more of my scalp ... freaks me out. This is good to know it's just a add on & not a whole routine. I love that there is a solution out there for thinning hair for women; 10-15 years ago, this was only viewed as a problem men faced. 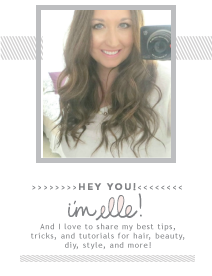 Love that you can work this product into your beauty routine and get some results! Interesting! I went through a period in my mid-20's where my hair started shedding like crazy. I wasn't pregnant, had never been pregnant and the doctors could never figure out why. It did stop, but I know when I look at photos of my teen years my hair was def. A LOT thicker... although, it was almost too thick then (or at least that is what I tell myself to feel better! ha!). I'm ok with my hair right now, but have had shedding after each pregnancy. It's good to know about this for the future! I've known lots of women who have had this problem. My aunt has used Rogaine, and it works for her. I have fine hair to begin with and it has definitely been thinning as I get older. I need to try this! I didn't know that Rogaine had a line for women, so that is so good to know. I used to have pretty thick hair, but the first few months postpartum, I was losing hair like crazy! I will definitely keep this product in mind! I already have thin hair, so this is scary! I wouldn't want it to be thinner. I'll have to check out they product! Interesting. I don't have thin hair. Mine is super thick. But Natalie has thin hair. Just a heads up though about this, once you start you need to continue using it to see results. If you stop, so does the effect. Also this can be used when pregnant or nursing, so that's a pretty significant chunk of time. I experience post-pregnancy hair loss at the moment. Last time I didn't use any special products to treat it, I know it will stop eventually, but I might try a few things this time. Just out of curiosity. I'll definitely need to keep this in mind as I get older. I am so thankful for my thick head of hair right now, even if it does take way to long to style! This is the first time I'm hearing of the Rogaine foam, Elle! Thanks for the heads up. I know someone who suffers from thinning hair. I don't really know how to approach her about it and suggest this, but good to know this product exists. A friend of mine was actually just bemoaning her thinning hair over lunch the other day. I need to tell her about this product. It sounds really easy to incorporate into a beauty routine. My hair is so fine and I think I'm starting to lose some! I'm hoping it's just shedding during summer, but I may give this a try! I think this is a huge problem and MUCH bigger of an issue then it use to be. When I was a kid you almost never saw a women with that that was thinning to the point that she was balding, now I see it all the time. I see anywhere from 3-5 women a day with thinning hair that looks like balding. I do not think it is just heredity much like autism is it is on a major rise and I am sure it is the environment. There is something in our modern day environment that is effecting the endocrine system. Not sure what it is but it it not just natural. I thought of trying this but there are side effects with Rogaine. So not sure if I would do it. I guess it depends. I've never heard of this before, but I know that hair thinning can definitely be an issue for women. So far, thinning hair isn't a problem for me, but it's great to know that there are options! I had no idea that they came out with this product. I don't have hair any hair thinning issues, but this information will be helpful for women who are experiencing hair thinning issues. So interesting!! While I was pregnant, I had the most beautiful, thick, and shiny head of hair; and then after pregnancy, it was the COMPLETE opposite! It started to fall out like whoa! It's better but still not great. Maybe I should invest! Amazing!! Those statistics are scary. I am glad there is a product out there like this that will help. Such a neat interview - great to read! Yes, thank you! I've had a little bit more hair loss than normal lately (or maybe I just noticed it more?). So I am absolutely going to get this! I didn't realize hair loss and thinning could start so young! I have crazy thick hair so it's an issue I've never thought about it, but you've brought it to my attention and I learned something new. My hair has always been baby fine, I cant even imagine it getting any thinner. Yikes! Totally looking in to this! At one point I was on a medication that had my hair falling out by the hand-fulls and I definitely started looking up ways to get my hair to thicken up. Thankfully since mine was medication related, my hair re-grew after I changed medicines. But I did hear about Rogaine for Women during my researching period.